Flavourcape » flavourblog » FOODSTUFF: Is a take-away chicken worth R68? FOODSTUFF: Is a take-away chicken worth R68? I’ve driven past a few times and heard good things from foodie friends. The pricing always scared me off. But yesterday a daytime swim and a sneaked coffee at Jardine Bakery – the deal was we’d only stay if they had the sublime dark chocolate brownie dotted with white chocolate – meant there was no time remaining for a supper shop. Rotisserie 360 has a hatch across the road from Jardine on Bree. And the rotating chickens look and smell so good… But at R68 per 1.5kg chicken, I expect a lot from a bird. Don’t you? A half chicken sells at R38. Other items available include salads. I hated the coleslaw dished up at every family braai in the 80s, but I noticed some coleslaw here - it’s rather appealing now in a retro kind of way. At home we knocked together couscous and roasted vegetable segments and had a delicious supper. But was the chicken worth it? Here is what the menu brochure claims: farm-fresh free-range chickens are marinated overnight in a choice of lemon and thyme or chilli, lemon or thyme. We weren’t given a choice but I think we ate the chilli and thyme version. The rotisserie white meat was moist with flavoursome crispy skin tasting mildly chilli-ish. Fresh thyme formed a pleasant dominant flavour. The chicken was bigger than those sold by Woolworths, but then Woolies butter-basted versions sell for around R45. Admittedly, the Woolies white meat often tastes dried out. 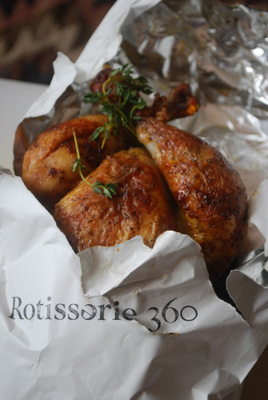 Rotisserie 360 chicken tastes homemade and beats Woolworths in flavour. It makes a convenient option if your budget is unlimited. But it isn’t so good that I’d give up ever roasting my own. FlavourTip: Rotisserie 360 offers a picnic service for around R70 per head, consisting of chicken, homemade mayo, salad, baguettes and brownies. Booking 24 hours in advance recommended.